That’s the headline of a story on NPR’s Morning Edition on July 19. Host Steve Inskeep interviewed Kimberly Nicholas of Sweden’s University of Lund – about a research study I’m glad to report has gotten a fair share of media coverage. The study can be found here. KIMBERLY NICHOLAS: The single biggest impact that we found was from having a child. The reason for that is because that measure accounts for all the choices that that child would make in their life – and their descendants. INSKEEP: What did you think and feel when you reached that conclusion? NICHOLAS: Well, I think – I knew this would be a sensitive topic to bring up. Certainly, it’s not my place, as a scientist, to dictate choices for other people. But it is my place to do the analysis and report it fairly. You know, something really important we found is that most government recommendations weren’t really talking about what made the biggest difference. And they weren’t quantifying how big of a difference it made. I’m not entirely impressed with Inskeep’s approach here. INSKEEP: I’m thinking about the implications here, though, because if a few individuals make a choice to have no children or fewer children than they otherwise would, that’s going to make no effective difference. This is something that millions or billions of people would have to decide, I would think, in order to make a significant difference. Do you think that some governments somewhere should be pressing their citizens in some way? He seems to head straight for the reasons this kind of information generates controversy, assuming the natural progression from this information is for governments to establish legal limits to family size. Shades of the dystopian 1972 sci-fi flick, Z.P.G. That film obviously didn’t do anything to help public perception about making responsible family size decisions in the face of overpopulation. Nor does the assumption that we should take information from Nicholas’ study and start legislating family size. Can’t prospective parents worldwide just take this information into account and make more informed decisions? 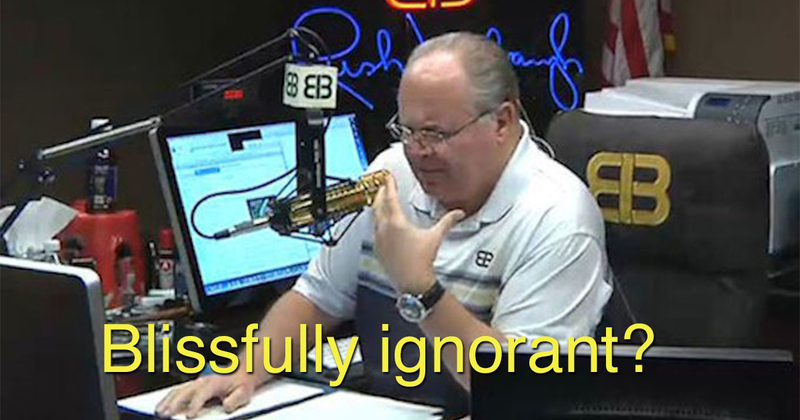 Yes, that is exactly the point, Rush. Every additional person eating meat and driving a car places a huge burden on a planet already weakening under the strain of 7.6 billion people all trying to live well. Finally, Limbaugh, with half his brain tied behind his back, comments on what Nicholas shared on NPR about what she is doing with this information. Hypocrisy is a big turn-off, for sure. But there’s an interesting point here. Precisely BECAUSE so many of us have footprints that are too big, if we decide to have fewer children, the reduction in impact is significant. That leaves a little more breathing room for other human beings, especially the ones who aren’t living privileged lives enjoying double-bacon-cheeseburgers on Lear Jets. But, yes, let’s encourage everyone to scale back their over-consumption AND their over-reproduction. Here, Bethany Mandel shows us that women and mothers, too, can be insensitive and miss the point. Again, how interesting that Mandel is so close to connecting the dots here. If you want to have an occasional steak or Caribbean vacation, it’s all the more imperative that you refrain from being an octomom. It’s pretty simple math. Now, I confess that when critics of sustainable living are snotty like this, it’s tempting to be hypercritical of them. I’m exercising super-human strength here today in an attempt to, instead, UNDERSTAND them. Is it possible we can be less combative and more empathetic in publicly discussing our future? I don’t see any evidence that we can, unfortunately. But I’m going to give it a try. How can we overcome their fear of collective agreement to exercise caution about the future? One thing I’m going to do is have an adult conversation about this issue at the next GrowthBusters webinar on August 9. Get information and register here for this free webinar. I’ll talk with Travis Rieder and Madeleine Somerville about the hateful responses to this kind of information, and explore how we might get past this. Also, two weeks ago I shared on the Wall of Fame here a new GrowthBusters video in which we took to the streets to see if people are ready to consider the family-size aspect of our responsibility to leave a healthy planet for future generations. We got surprisingly little resistance to the idea. Clearly we didn’t interview any ultra-conservative pundits or their loyal followers. So, again a mixed bag, and we still have miles to go before we sleep. There’s room for improvement in Inskeep’s handling of this subject, but overall I give high marks to him and the NPR Morning Edition team for doing the story. Thanks also to Forbes, Popular Science, and Science Magazine (all honored on the Wall of Fame here), for covering the important study. I’ll see you at our August 9 webinar. You can help:We’re scratching the surface of making small families cool and large families out out of style. No judgments being cast, but having lots of kids just has to go the way of driving a Hummer, leaving the engine running while you visit with a neighbor, using plastic disposable grocery bags, and living in a house big enough for Goldilocks, the three bears, and your soccer team. Help us speed this cultural evolution by taking pride in your own small-family decision. Display one of our Small-Family stick figure window decals (Childfree, Stopped at Zero, Stopped at One or Stopped at Two.